In Week 4, I was in Springfield, Massachusetts on Thursday. Luckily, there was a game being played in the northern suburbs. The South Hadley Tigers faced the Amherst Regional Hurricanes in a rare Thursday night league game. Neither team had a victory yet this year, and both had matching 0-2 records. Now, the field in South Hadley can best be described as a field. There is a semblance of a track around the field, however it is just small gravel and not very well maintained or wide. The field sits behind the high school and baseball/softball fields. A large white barn sits behind the stands and butts into the trees behind the stands. The stands sit on only the east side of the field. An elevated pressbox/coaches booth sits to the west side with nothing in front of it. The home stands are modern aluminium risers, but start at ground level and only go eight rows high. The total crowd for the night was somewhere around 300 to 400. There wasn’t much of a divider between the fans and the field, other than where the gravel ended for most of the field. A small concession booth stands to the north endzone. The openess provided great opportunities for photos of the field before and during the game. Now, based on my standards, Massachusetts football ranks rather low. These two teams were winless, sure. However, this was a large school, that had what amounted to an OHSAA Division VI or VII/PIAA small Class A field and fan base. The offenses were both vanilla and predictable. No major athletic individuals with either team, and the offenses were run, run, run. But neither were that affective. Kicking, at least for South Hadley, was impossible, and showed in their three touchdowns with no conversions. The other game of note, was the following week on Saturday in Olean, New York. 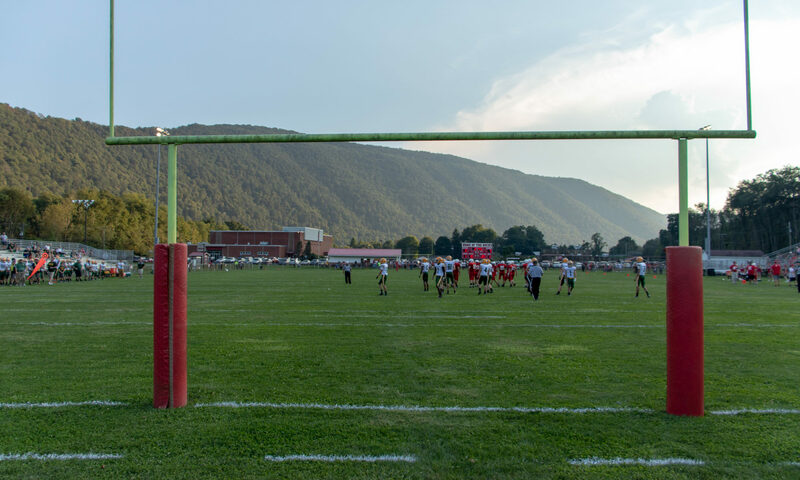 Olean has traditionally played Saturday night games. In Western New York, they’re the only school I can find that does so. Most that don’t play on Friday will play on Saturday afternoon at 2pm, of which there are many. I had planned on attending a game here in 2013, but the schedule never worked out well. However, the stars aligned this year. There wasn’t another major non-regular game on Saturday night this week. And it was a great matchup. Bradford (PA) at Olean (NY). It was the 116th matchup between these cross-border rivals, and I would finally get to watch a high school game at one of the more unique stadiums. Bradner Stadium in Olean may not rank up there with the likes of Paul Brown Tiger Stadium, the Pit at Elder, Ratliff Stadium, the Wolvarena, or any other parthenon of high school football. However, it is definitely worth the visit. Sitting on the main drag heading east out of town, the home stand sits right along the street. However, the field is sunken, and the top row of sits sit level with the sidewalk behind the wrought iron fence. The primary parking lot is by the park across the street. The entrance is through a walkway under the street. Now, what makes this place so interesting, is that it’s also a baseball field. The homeside is the third base line, and the stands wrap around the eastern endzone for the visitors. The left outfield sits deep across the field with nothing more behind the visitors side. The homeside has the large pressbox and coaches box near the top of the stadium, and has the dugout next to the field. At this point, the home side only has four rows of seats crammed within this small area. The stadium itself seats upwards of 4,000 if the endzone curve were to be completely filled in. Because of the baseball cross-over, it includes large black poles every so many feet from near the dugout down to the east endzone and around to hold the netting to stop errant baseballs from the crowd and roadway. The stadium has just recently underwent a renovation, to bring in a college wood-bat league team. The game itself, between the Olean Huskies and Bradford Owls was a battle between the favored Huskies and the undermanned and underperforming Owls. Bradford made it a decent game, but Olean ran away with it. The rest of the season consisted of Ohio and Pennsylvania games. Friday nights were typically Greenville Trojans games, up until Week 10. Given that the game with Sharpsville would amount to nothing more than a scrimmage, I chose instead to attend the Neshannock-Greensburg Central Catholic game in suburban New Castle. Though this game was projected to be one-sided, I opted for this game because it was my girlfriend’s alma mater. It’s a small school in a well-off community. The field and stadium does not scream ‘1A’ school. It has turf. Manicured landscaping near the entrance depicting NHS. And, for Halloween, they were giving out free foam swords (they’re the Lancers) and cupcakes. Thursday games, in the past, consisted of WPIAL televised games. Because Root Sports Pittsburgh chose to air Friday Night games again, it left quite a bit of the schedule open. Luckily, there were several non-traditional Thursday games to fill it out. Aside from the South Hadley (MA) game, I also got to see games at Keystone (PA) vs. Clarion (PA), Chagrin Falls (OH) v. Wickliffe (OH), Geneva (OH) v. Madison (OH), and Hudson (OH) v. Mentor (OH). First, the Keystone Panthers have a typical, small rural stadium. Short stands, wooden, and unbelievable packed for a game against Clarion that was destined to be a blowout. Chagrin Falls’ C.S. Harris Stadium is an absolute treasure of a stadium. It sits slightly offset from the field, but the roof, high seating, and concrete with no benches is definitely a unique throwback to stadiums that are falling by the wayside. Geneva’s game against Madison is a local rivalry. As it was last year in Madison, it was on Thursday in 2014. Geneva plays their games at the SPIRE Stadium at the SPIRE Institute. Most in District 10 are well aware of this facility now. It is a world class facility with many indoor and outdoor fields and training facilities. This game was schedule from the beginning at the outdoor facility. It doesn’t ‘feel’ like a high school stadium. Especially when the concession stand and bathrooms are inside at the indoor soccer field. Which turns out to not be regulation size for the PIAA. And lastly, was the game in Hudson (OH) v. Mentor (OH). This game was schedule for Thursday for television. And what a game they chose. Both teams came into this week 9 matchup at 8-0. Hudson was looking to finally clear the hurdle and be taken as a ‘major’ team in Ohio. A packed stadium, and a lot of turnovers by Mentor, and Hudson won it 41-27 en route to their 10-0 season and #1 seed in the OHSAA Division I Region 1 playoff. Also on Thursday, were ‘city games’ at Parma’s Byers Field, Pittsburgh’s Cupples Stadium, and Cleveland’s Roye Kidd Field. Byers Field is a large, albeit featureless stadium. It’s not that redeeming in any manner other than that it adequately fits whatever game is going to be played in it. It’s massive. Has turf. Parking is somewhat suspect, but was sufficient for the Valley Forge-Revere game I attended. The two Pittsburgh games were Allderdice-Westinghouse and Carrick-Brashear. Neither game had much to them as Westinghouse and Carrick were especially bad this year. And lastly was the Week 10 matchup in Cleveland. I had planned to attend two games in Cleveland. The first was the Whitney Young-East Tech game at Roye Kidd Field at 3pm, and then the night game at Collinwood Athletic Complex at 7pm for Collinwood-Lincoln West. However, as I’ll mention later, Cleveland Heights was also hosting East Cleveland Shaw on Thursday night. I had been to this stadium three times in the past, but wasn’t really planning for a fourth. I hadn’t known of the Willoughby South-Eastlake North game taking place. Else, I would’ve traveled there. However, all three Cleveland and Cleveland Heights games are in the same vacinity, so I could easily go from the afternoon game to whichever evening game I chose. I chose poorly. Cleveland Heights demolished Shaw, 42-6. Collinwood, on the other hand, won 28-22 over Lincoln West in Overtime just up the road. As for the early game? It was interesting. Whitney Young is a Division VII school, and not good. But, neither was East Tech. The stadium is nice, but not well cared for, and the attendance was sparce. It was the officially the smallest crowd I’ve ever watched a game with. The most I counted in the stands, not counting the band, was 44 fans. Then you realize it was a matchup between an 0-9 and 1-8 team on a Thursday at 3pm in a city with high unemployment and poverty. I was hoping Whitney Young could pull the improbable upset, and had a beautiful long pass that setup the first touchdown. However, that lone touchdown would be the peak of their power. East Tech ran away with it. Starting with the last play of the first quarter. The final was less impressive: East Tech 42, Whitney Young 6. Now, for Saturday games. I always was able to find two games each week from Week 3 through Week 10. Also, Week 7 featured a delayed game due to insufficient lightning that I got to watch the ending. Now, some venues I’ve seen in the past. For the first time, I’ve traveled twice now to the Johnstown (PA) area for games. Last year, I really enjoyed trips to Sheffield (PA) followed by a night game at St. Marys (PA) for the Elk County Catholic games. Also, games at Shaker Heights (OH) or Cleveland Heights (OH) were repeats. Schools that regularly play on Saturday aren’t going to be reference, unless it was a place I had never been before. Such as the aforementioned Johnstown games. I recapped this game earlier this year. It’s definitely a relic sitting in an old river town south of Pittsburgh. Quaker Valley, though, ran away with this game. A stadium that all fans sit on one side, and also look right into the sun through the game. 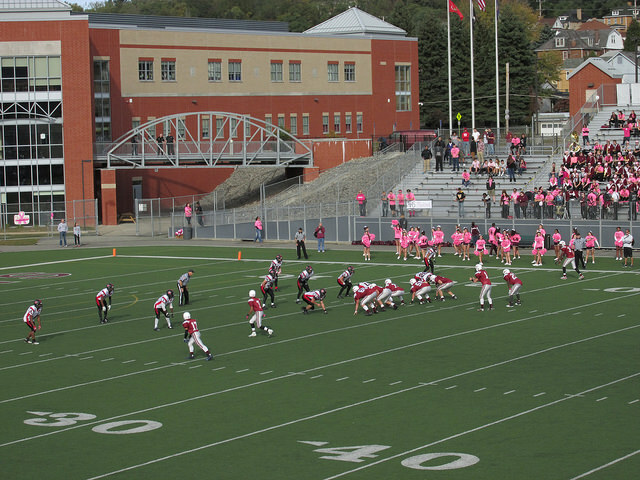 This stadium sits on top of a hill in Pittsburgh’s southern suburbs. The home field of Keystone Oaks Golden Eagles. It features turf, and all new stands. A very nice stadium. However, it gets windy. Of personal note, I lived just a few blocks away from this stadium during my two years in Pittsburgh. Though I never attended a game there because I actually lived across the border in Mt. Lebanon and attended their games. One of my favorite places to watch a game. This field sits atop a hill behind the stadium. Surrounded by rolling green mountains, it’s aptly named. A great stadium, one of my favorites. Even if Shaker Heights was horrible this year, I enjoyed coming over to a game. An interesting note, Roy Kidd Field, Shaker Heights’ Rupp Field, and Cleveland Heights’ Hosford Stadium are all just off Lee Road on Cleveland’s East side within a few miles of eachother. As mentioned above. This is another favorite of mine. The old school towers over the field’s visitor section. Which frames the field and gives a great backdrop. It also was renovated and now has metal bleachers with a turf field. This was schedule for Saturday due to the long travel for Port Clinton. The stadium was renovated recently, and it’s clear the home field didn’t always used to be the home side. The scoreboard faces the visitor side at an angle. This is a nice venue, though. Don’t be fooled into parking near the southeast entrance. There is no entrance there. The entrance is actually at the northwest corner. The game itself started out great. However, the 29-29 halftime score devolved into a 58-29 beatdown by Port Clinton. Nothing much different this week other than Heights came through with the win. Ambridge regularly plays their homecoming game on a Saturday afternoon. This is another favorite of mine. Given the name, the school incorporates a bridge into their school. From the upper corner of the stadium to the second floor of the high school, there’s a painted steel bridge. The home side is modern aluminium, while the visitor side is old concrete that’s deteriorating. However, it provides the best views if you ever attend a game here. Surprisingly, wooden benches in an otherwise nice stadium. Turf, a band shell, huge seating capacity. I sat the second half on the visitor side, and the wooden benches are deteriorating badly. Many warping or crumbling. It didn’t help that Niles McKinley also was horrible and Ross wasn’t bad. Despite the more pedestrian 41-20 finish, there was something going on back in Beaver, PA.
Based on recent history, Ambridge and Beaver both play their homecoming games on the same weekend. Ambridge on Saturday afternoon and Beaver on Saturday night. In the past, I would attend both games. However, this year I really anticipated attending a game at Niles. The Niles game was my first in the venerable stadium, and I opted to forego my regular attendance at Beaver. However, there was a power issue to some of the light standards, and the game was delayed until after 8:30pm. With an hour drive, I arrived during the third quarter to watch the end of what was, at the time, a close game. However, Beaver ran away with it at the end, 40-7. This was my first trip to the Johnstown (PA) area for games. Several teams play Saturday afternoon games: Westmont Hilltop, Ferndale, and Conemaugh Township. Also, Bishop McCort (Johnstown) and Bishop Guilfoyle (Altoona) play on Saturday night. I had not known of Bishop McCort playing on Saturday, because of calpreps and WesternPAFootball.net erroneously listing them as Friday. However, I had another Saturday night game to attend which drew me down to Westmont. This is a great venue in a great neighborhood. It reminds me of a smaller Shaker Heights in setup. The school sits strategically near the center of town, and sits without lights for afternoon games. The crowd was small in the rain, and the team wasn’t the greatest. But, it was a great atmosphere. Westy, as they’re called, never stood a chance in this game. After the game, it was on to a great place to eat, called Asiago, which is located on the mountain side near the Johnstown Inclined Plane. Great food. Especially the wild mushroom ravioli with steak tips. This was the draw to drive down here in the first place. Mercer County small school power, West Middlesex, was playing an inter-district game just south of Indiana, PA. This stadium, too, has some charm. Located away from the high school, it’s been recently renovated with new bathrooms to the north end of the field. Heavy rain, though, made the field wet, and a little rain throughout the game made it a nuisance. Homer-Center wears all black with a little white, which makes for some unique high school uniforms. Again, I enjoyed the venue so much, I decided to attend another game here. It was either here, or see the Sheffield/Elk County Catholic schedule I had originally planned. Without rain, it was a great day for football. Westy jumped out to a 19-0 lead, and it looked like they may be on their way to a win. Then Bishop Carroll stormed back with 35 unanswered, to win 35-19. After the game, it was another local game. But, it was an early dinner at Asiago’s again. This was the draw for coming down two straight weeks. I’ve been in Johnstown many times. I’ve been to the Cambria County War Memorial Arena. So, I’ve driven by this stadium several times. Situated on the northwest corner of downtown at the confluence of the Little Conemaugh and Stoneycreek to form the Conemaugh River. It’s actually a baseball field, that has housed numerous minor league teams. The stadium is crammed into its location, which gives it an odd shape. After a recent renovation, Pitt-Johnstown plays their baseball games here. Also, Bishop McCort plays their football games here. In week 8, they hosted Bishop Guifoyle, which they lost badly. However, there was the Homer-Center v. West Middlesex game to attend. This week, it was the marquee. They also were hosting Central Cambria of Ebensburg. I’ve liked Ebensburg and have been to the town twice in the past. So, I was cheering for them. Just as it was at Olean, this is primarily a baseball stadium with a football field fitted in. The home plate sits to the northwest corner, and the field comes down from the right field foul territory to inside the right field line. The seating, therefore, is just as bizarre as it is in Olean. A large light standard blocks a lot of seats, and the south side of the 50 has very few rows as they’re pushed back for the right field line. The visitor side of the field is short, as there’s a tall fence to catch home runs from reaching the car dealership across the street. Which is quite possibly the worst place to locate a new car dealership. It’s also between the field and where we parked. The only open gate is in the right field corner. You then walk down the right field line either by climbing the switchback steps or following down the concrete corridor near the river’s edge to reach a portal to the seating area. It also features chair back seats around the home plate, but which sit far away from the sideline of the football field. The home band sits in the right field outfield stands, while the visiting band sits in the right field stands as they jut out to the left endzone. The field is also turf, and shows the four dirt patches where the bases and home plate were. The pitchers mound is lowered and covered, but shows the signs of loose dirt spread around the regular turf. In the end, it was a great makeshift venue and has a unique approach. Also, Central Cambria held on for the win, 33-21. I had seen the end of a game here last year. However, this was my first full game. It also wasn’t a game. I had driven past United’s high school on my way to Johnstown, and had read about their coaching problems. Farrell managed a kickoff return to open the game, a punt return, an interception return and a safety. To say this was one-sided would be an understatement. I chose the Farrell game because it was a unique location. I had seen games at Bedford and Massillon. And there wasn’t a lot of other options. There was no option, then, for a night game. Given the Browns game on Sunday, I decided on a more local game. Lakewood St. Edward-Cleveland St. Ignatius was a decent option, as well. Though that turned one-sided as well. This game, though, was all Gilmour Academy. They ran at will until this chose to call off the dogs. Then, as the game progressed, YCS scored twice to make a showing. A female kicker, #92, for YCS tried both extra points, and was successful on her second attempt. It was the final points of the game. Later this year, I plan on writing a recap of the whole season as I’ve done in the past. I also plan on updating the playoffs as I will be traveling extensively. So far this year, I’ve attended 58 games in person. My girlfriend has accompanied me to 50 of them. I had originally planned to see the six NYSPHSAA Section 6 Championships at Ralph Wilson Stadium on Thursday and Friday and return back on Saturday for the Greenville-Northwestern game at Wilmington and then see Youngstown Liberty-Gilmour Academy at night. However, that was prior to me checking out the rest of the New York schedule. Two of the four Section 5 Championships and the Class D-DD playoff are being played at Sahlen’s Stadium in Rochester on Saturday. And then there’s four Section 3 Championships at the Carrier Dome in Syracuse on Sunday. The reason for Sunday is the Syracuse game on Saturday delays it. Because the Browns play on Thursday, I’ll attend the four games on Sunday as well. New York is consistent in wanting their later round playoff games all played at one site. So, it makes for easy scheduling. It also gives the best venue for the teams. In Week 13 and 14, I will be Iowa, Minnesota, Nebraska, Missouri (possibly), and Illinois for games. I’ve planned a similar trip for years, but it never worked out. The Browns are on the road for two straight weeks. Iowa plays three of their six championships on Thursday in Week 13 at the UNI-Dome in Cedar Falls, and Minnesota plays their seven championships on Friday and Saturday in Minneapolis at TCF Bank Stadium. On Monday and Tuesday, Nebraska plays their six championships at Memorial Stadium in Lincoln. If Webster Groves (MO) and Kirkwood (MO) are out of the playoffs by Thanksgiving, they play a varsity game on Thanksgiving at noon. If either team is still in the playoffs, then it will be a Junior Varsity game. There are seven games on Friday and Saturday total at the Edward Jones Dome in St. Louis. However, I’ve seen games in Missouri several times (one of my favorites being at Crystal City), and have never seen a high school game in the state of Illinois yet. Though, their eight title games will be played on Friday and Saturday at Memorial Stadium in Champaign, Illinois. Week 15 will be a trip to New Jersey for either six or eight games at MetLife Stadium and/or Rutgers Stadium. I’ve decided to forego seeing the OHSAA Championships at Columbus. In Week 16, it will be four championship games in Hershey, PA. And Week 17 and 18 will be another trip. This time a drive down to Arlington, TX for the UIL Championships over three days. And then it’s a drive east to Fort Lauderdale, Florida for the three televised “State Championship Bowl Series” games. Hopefully they’re still on. However, I’m going to Florida for Christmas with my girlfriend before driving back home to finish out the year.